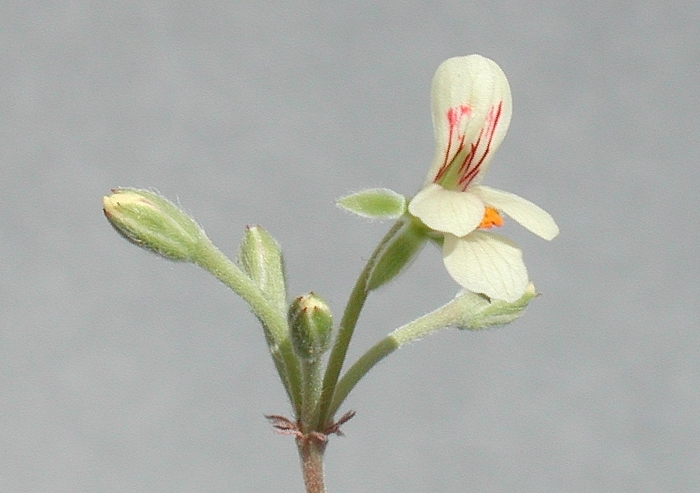 Pelargonium luteolum N. E. Br. Kew Bulletin (1913) p. 299. Lamina variable, palmately compound with three main pinnae. Pinnae 18-120 mm long, segments 20-50 mm, 0.5-5 mm broad. Petiole erect, up to 140 cm long hirsute with appressed hairs interspersed with glandular hairs. Stipules subulate adnate to petioles with apices free, ciliate. Usually branched, each pseudo-umbel with 3-16 flowers. Peduncle densely hirsute with appressed stiff hairs interspersed with short glandular hairs, pedicel ~0.5 mm. 5, lanceolate, posterior erect, other recurved. Hypanthium 13-24 mm. Petals white, cream to yellow, ligulate, posterior with red linear markings, 7-15 x 2-4 mm, adaxially usually with trichomes, anterior obovate, slightly broader, the lateral two covering the median one. 5 fertile, of approximately the same length, concealed. 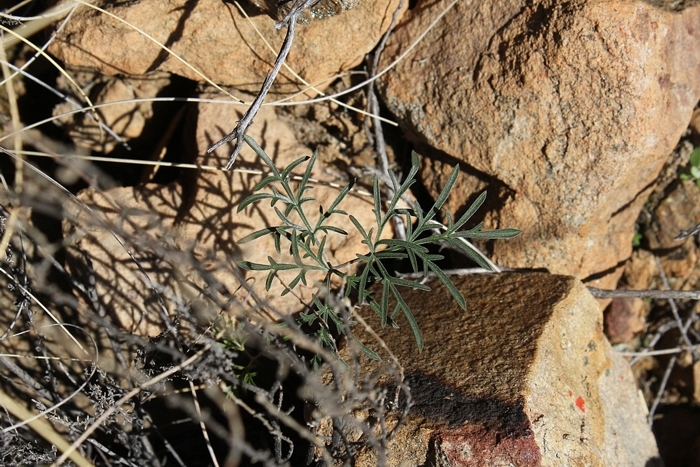 Rooiberg, just south of Calitzdorp, is home to significant populations of P. luteolum on the exposed mountain top, enjoying fabulous views north and south. 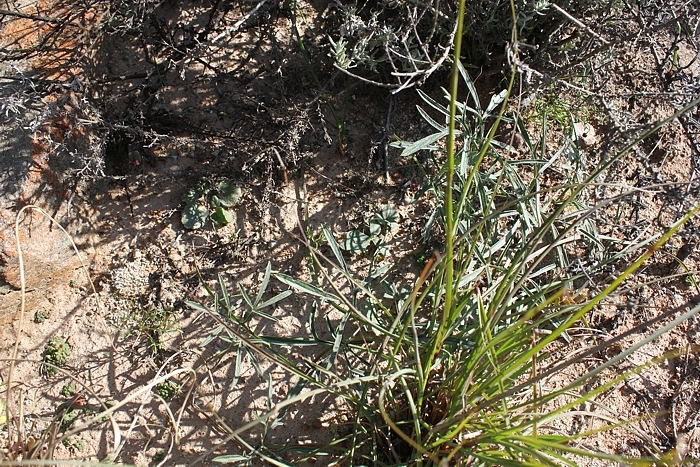 The leaves of P. luteolum are very easy to spot, they are usualy conspicuous and large. 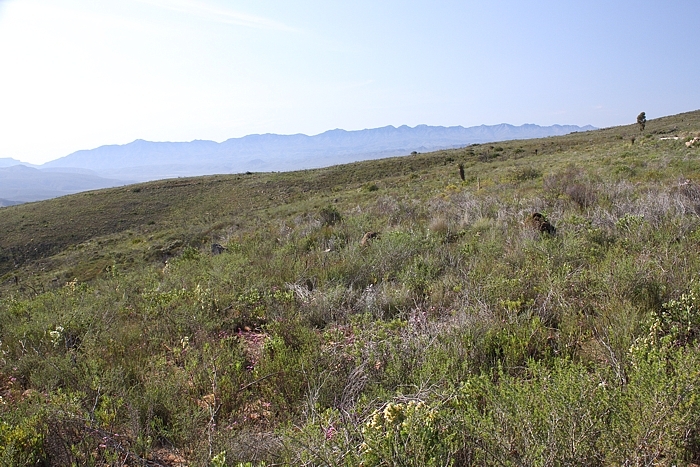 Here is a healthy population on Rooiberg, with mature plants as well as seedlings. Among the geophytes, P. triste and P. raduliforme also abound here. P. luteolum and P. gracillimum can sometimes be difficult to tell apart. 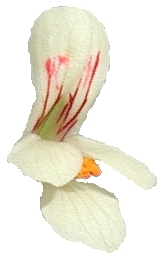 The hypanthia of luteolum are usually shorter, the posterior petals of gracillimum never have trichomes and are markedly longer than anterior petals. Petal colour of luteolum is usually pale yellow to yellow, and that of gracillimum usually pale pink to pink, but either can be white. 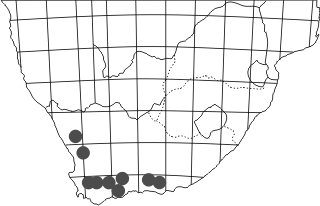 Their distribution overlaps in Seweweekspoort.